On 20 September 2018, the Community Plant Variety Office held a seminar on “The benefits of Plant Variety Protection” in Sofia, Bulgaria, in collaboration with the Bulgarian Ministry of Agriculture and Foodstuffs and the Bulgarian Executive Agency for Variety Testing, Field Inspection and Seed Control. The main objective of the seminar was to promote investments in plant breeding and benefits in protecting new plant varieties at national or EU level. More than 130 participants from the private and the public sectors attended the event. 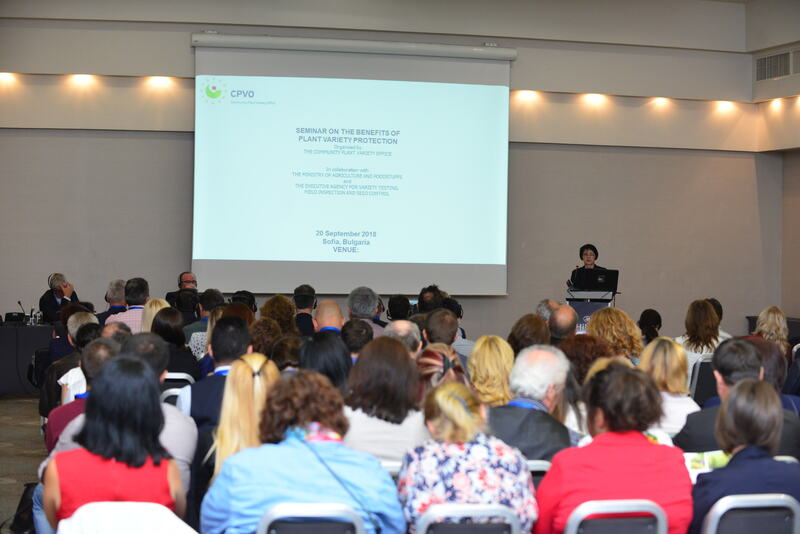 Presentations were given by experts from Bulgaria, Czech Republic and Serbia on the organisation of the plant variety protection system and enforcement rules applicable in those countries as well as experts from UPOV, breeders’ organisations, farmers’ associations and public research institutes. The first session aimed at presenting the EU PVR system, and the experiences of Bulgaria, the Czech Republic and Serbia with special focus in the wheat breeding challenges in the Balkan region and the royalty collection system in the Czech Republic. An overview of the role played by the plant variety protection in supporting public-private partnerships concluded the session. The second session focused on the benefits of plant variety protection from the perspective of breeders, public-private partnership and farmers. The last session focused on challenges in enforcing plant varieties. The seminar showed that an effective system of plant variety protection is a driver for investments in agriculture through the development of new varieties of plants for the benefit of farmers and the society at large. In this context, plant variety rights represent a tool capable of fostering innovation in agriculture and guaranteeing return on investments through efficient systems of royalties’ collection to the breeders, and access to forefront innovation to farmers.